RAM is a shortcut for Random Access Memory. The chips of computers, which are used as temporary memory, are called RAM. The input - also programs and data - will be loaded into the ram before the CPU can run this program. RAM-Chips can also be used as caches in harddisks, CD- or DVD-drives or as video ram (VRAM). The C64 has a RAM of 64 KBytes (65536 Bytes). Useable are approx. 39 KB for BASIC-programs. In the original version 8 RAM-chips are used with 8 KByte. The chip-synonym is 4164. In the newer version C64C there are only 2 RAM-chips used with 32 KByte (chip-synonym 4464). 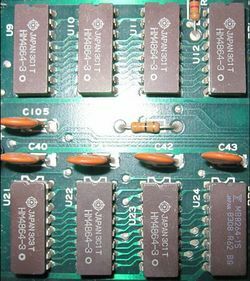 The RAM of the C64 is so-called DRAM (shortcut for Dynamic RAM). The information of a DRAM must be refreshed after a few milliseconds. The chip-synonym of the colour RAM is 2114 with 0,5 KByte. The colour RAM used SRAM (shortcut for Static RAM). This RAM-type does not need a refresh. The RAM of the C64 can be enhanced with cartridges. The famous Memory Cartridge was built by Commodore and is called REU (RAM Expansion Unit). Another Memory cartridge is called GeoRAM, which is only used with the operating system GEOS. 2114 1K x 4 SRAM. One of these makes up the text screen color RAM at 55296–56295/$D800–DBE7. Three of these chips (expandable by another 8) make up the main memory in the VIC-20. 4116 16 K x 1 DRAM. Needs −5 (VEE), +5 and +12 (VDD) volt power supply. Bend pin 1 and 8 upwards so they no longer go into the socket's connectors. Connect Pin 8 and 9 with one another through a short piece of wire. Make sure pin 1 and 8 are not in contact with any other components nearby. Insert the chip like this into the socket. 4164 or 4264 64 K x 1 DRAM. If you need one of the 4164 chips, you can also use a 41256 instead. You have to solder a short piece of wire between pins 1 and 16 of that chip (these are the pins just left and right of the alignment notch on the chip). This mod will make the chip look just like a '64 chip to the system. 4464 64 K x 4 DRAM. 41256, 41257 256 K x 1 DRAM. 44256, 44258 256 K x 4 DRAM. With the help of the cross reference table one can see the classifications of each of the producers for RAM chips. Although they are electrically and mechanically identical, every producer has his own system to mark the RAM chips. While the preceding letters often hint to the producer, the following series of digits indicates the size and organisation of the memory. Next, there are often one or more letters, which most stand for the housing shape. Finally, there is again one or more digits, e.g. "-15", this tells you something about the maximum access speed. Example: 2114L2 - this memory chip has an access time of 120 ns (nano seconds) and can without any problems be exchanged by a faster chip 2114L1 (100ns), but not by a 2114L3 (150ns) or 2114L4 (200ns). As also today with the PC, you have to not only choose the appropriate memory size, but you also have to know where the limit for the access time is. For the 4164 DRAM, many C64 has DRAM´s marked with 150nS and 200nS speed. Also check the [PLA] chip at U17. This page was last modified on 1 August 2017, at 19:18.